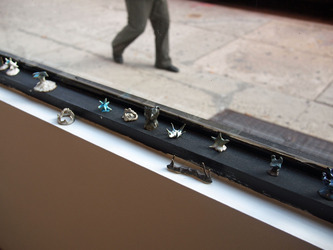 Sculptures line a windowsill in a gallery. If you look at them closely, the scale shifts. The sculptures become large and objects in the background shrink. The background is part of this piece. Pedestrians with umbrellas, windows in the buildings across the street, cars whizzing by, smoke from street construction, and street signs all play their part. Gallery hours: Wednesday-Sunday, 11am-6 pm. Hildur Ásgeirsdóttir Jónsson. The exhibition at Pocket Utopia, although organized independently from the two other simultaneously occurring solo exhibitions, highlights one woven painting along with and a selection of Jónsson's drawings. Elsewhere, at The Frances Young Tang Teaching Museum and Art Gallery at Skidmore College in Saratoga Springs, New York, Hildur Ásgeirsdóttir Jónsson exhibits a selection of artwork from the past five years, including large-scale woven paintings made on a ten-foot-wide loom. At Critical Practices Inc. and 21ST.PROJECTS in New York's Chelsea neighborhood, Jónsson presents several newly created pieces. Although the context might change, Jónsson demonstrates in her hand-dyed, silk woven paintings and ink drawings, an intimate connection with the landscape of her native Iceland. With an ethereal clarity and precision, Jónssonweaves a theme that is geology specific and generally about a sense of place that is dynamic, personal and spatial. But that's not all, this exhibition, which is part of a trifecta of solo shows for Jónsson, also includes part 2 of Sara Russell Dewey's ceramic sculptures in window gallery, pictured above.